This bundle includes two trainings. The first one is the foundation of IP networks. Whoever you are, an entry-level IT specialist willing to improve your network skills or you want to change your job but you do not have the experience in IT, this course is definitely for you. By simple analogies you will be taken by hand through the network technology going deeper and having opportunity to learn the key aspects of IP networks in an easy way. The Introduction to data transmission video track is divided to sessions starting from the easiest. First, we are going through the IP world. There you will learn the basics terms, how data flows between devices, what is the smallest portion of information and how this information is organized while sending across the network. Then you will get familiarized with bits, frames and packets as a data structure. After that we will qualify those bits, frames and packets to communication model. Then you will find out about connections, cabling, medium types and how we use them in real networks. The 5th session will explain the IP addressing, subnetting and how to plan this at the beginning of the network project. The last session will explain the DNS, DHCP, NTP, ARP network services and many more. 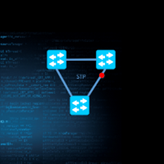 The second part training is an overview of IP routing techniques and routing protocols commonly used in Enterprise IP networks. This track leads you from the explanation of what routing is, description of routing table logic, to the routing protocols types, rules and configuration. You will be presented in easy way with graphical simulation the protocol descriptions, dependencies and CLI configuration. First you will learn about routing idea, static and dynamic routing types, then you will be taken through the protocols that you will meet in your network specialist career with detailed session about, RIP and RIPv2, EIGRP, OSPF and BGP at the end. Each single session will end with special questions to test your knowledge making sure that you will have best outcome. As you might need the quick and solid overview of routing before your job interview or you need to choose the right routing protocol for your project or you are preparing for industry certificate this course will help you a lot! Author of this course, Marcin Bialy is also certified Cisco Systems Instructor CCSI#35269 and has many different industry certificates. Join to become a professional network engineer!